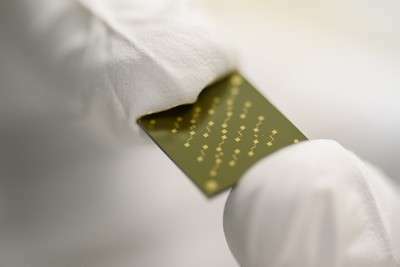 Carbon nanotubes can be used to make very small electronic devices, but they are difficult to handle. 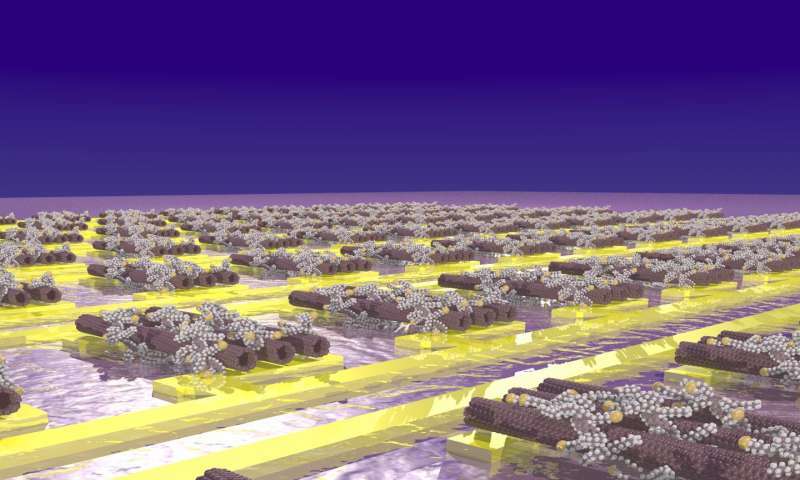 University of Groningen scientists, together with colleagues from the University of Wuppertal and IBM Zurich, have developed a method to select semiconducting nanotubes from a solution and make them self-assemble on a circuit of gold electrodes. The results were published in the journal Advanced Materials on 5 April. The results look deceptively simple: a self-assembled transistor with nearly 100 percent purity and very high electron mobility. But it took ten years to get there. University of Groningen Professor of Photophysics and Optoelectronics Maria Antonietta Loi designed polymers which wrap themselves around specific carbon nanotubes in a solution of mixed tubes. Thiol side chains on the polymer bind the tubes to the gold electrodes, creating the resultant transistor. 'In our previous work, we learned a lot about how polymers attach to specific carbon nanotubes', Loi explains. These nanotubes can be depicted as a rolled sheet of graphene, the two-dimensional form of carbon. 'Depending on the way the sheets are rolled up, they have properties ranging from semiconductor to semi-metallic to metallic.' Only the semiconductor tubes can be used to fabricate transistors, but the production process always results in a mixture. Loi's solution was to reduce the thiol content of the polymers, with the assistance of polymer chemists from the University of Wuppertal. 'What we have now shown is that this concept of bottom-up assembly works: by using polymers with a low concentration of thiols, we can selectively bring semiconducting nanotubes from a solution onto a circuit.' The sulphur-gold bond is strong, so the nanotubes are firmly fixed: enough even to stay there after sonication of the transistor in organic solvents. The production process is simple: metallic patterns are deposited on a carrier , which is then dipped into a solution of carbon nanotubes. The electrodes are spaced to achieve proper alignment: 'The tubes are some 500 nanometres long, and we placed the electrodes for the transistors at intervals of 300 nanometres. The next transistor is over 500 nanometres away.' The spacing limits the density of the transistors, but Loi is confident that this could be increased with clever engineering.